I love field trips. We try to go out as often as we can. Sometimes we go to a local environmental center. Sometimes we go to historical sites. This week we went to the art museum. When we first went to the art museum my son was about five years old. As we were leaving he looked at me and said, “That was soooooooooooooooooooooooo verrrrrrrrrrrrrrrrrrrrrrryyyyyyyyyyyyyy boooooooooooorrrrrrrrrrrrrrrrrrrrrrrrrrrrrrrrrrrrrring. I took that to mean that hw did not have a good time. For a while I considered not going back. Art was something that I had no experience with as a child. Sure we drew pictures in school but that was about the extent of my art appreciation. I really wanted my son to have a little more of a foundation in art than that. So we went back. And we continued to go back. Ms. Peggy is wonderful with the kids. She takes them on a short tour of the art museum. Then they all come back to the auditorium and create an art project based on the part of the museum that they toured that day. This week they started with a basic skull shape. Then they used paint, paper, ribbon, string, pipe cleaners, markers, feathers, and all kinds of other things to turn this plain paper skull into a work of art. It was awesome to see how the kids were able to create beautiful items from all the chaos. 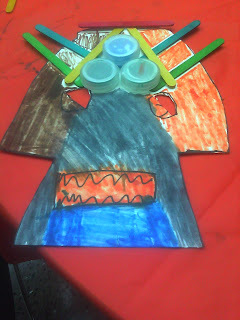 Several of the kids turned their papers into masks. They glued a stick to the back to hold the mask up in front of their faces. One little girl made a whole doll by putting a paper blouse on her mask and then attached ribbons to make a skirt. My son no longer considers the art museum a boring place. He looks forward to the class each month. This is the most important part of his art curriculum. Art has become an exciting subject for him.